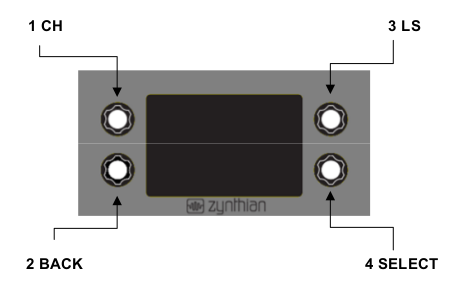 Difference between revisions of "Building a Zynthian Box using an official Kit"
Specifically, the instructions are for the assembly of kits v1 (version 1), those using the 2in1 circuit and the PiTFT 2.8' display. 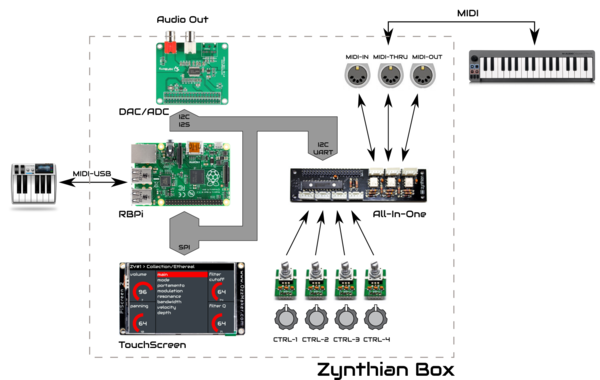 If you have a newer kit v2, based in the All-In-One circuit and the PiScreen 3.5' display, you better should read [[Building a Zynthian Box using an official Kit v2 | this updated tutorial]]. Specifically, the instructions are for the assembly of kits v1 (version 1), those using the 2in1 circuit and the PiTFT 2.8' display. If you have a newer kit v2, based in the All-In-One circuit and the PiScreen 3.5' display, you better should read this updated tutorial. It's a 11GB image file (plenty of soundfonts) compiled for RBPi3. After downloading the SD-image, you have to write it to a SDcard. 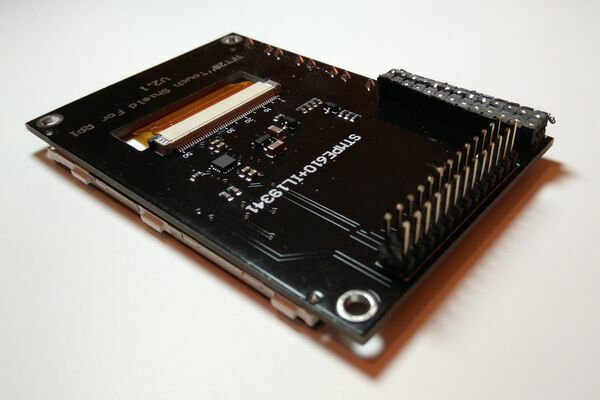 You need a minimum size of 16GB SDcard for the full Gorgona image or 8GB for the Gorgonilla lite image. Use Etcher https://etcher.io/ (free software works on Mac, Windows or Linux) to flash the image onto the SDcard. Or do it manually: There is a really good manual for this at this link. 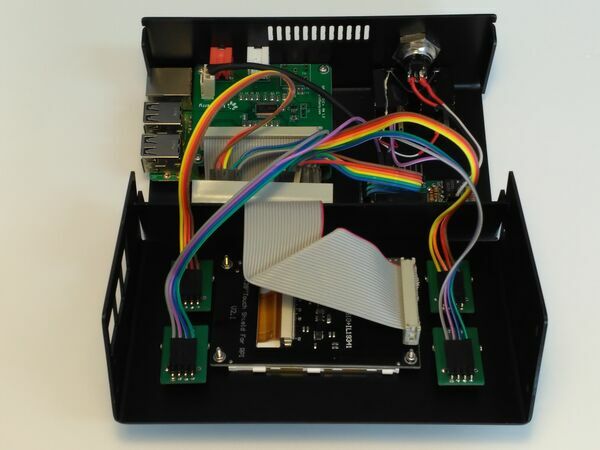 A Zynthian Box is a hardware device, a small digital computer designed to run the Zynthian Software. 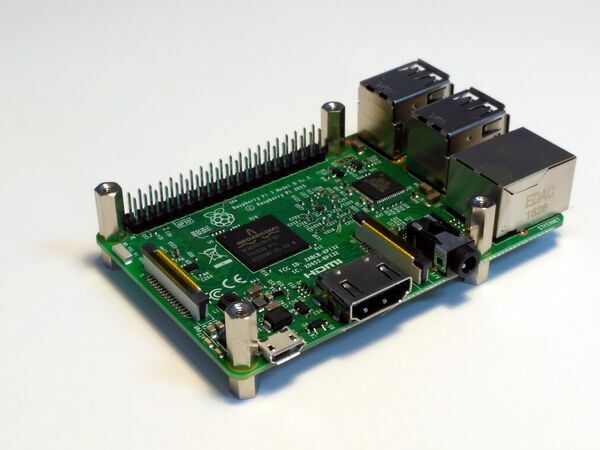 Currently it's based in the Raspberry Pi platform, but it could be easily adapted to other computer platforms. Of course, other arrangements and combinations are possible. You can easily configure your hardware using the Webconf Tool, or if it doesn't work, tweaking from the command line. It's the enclosure used to put on all the parts. 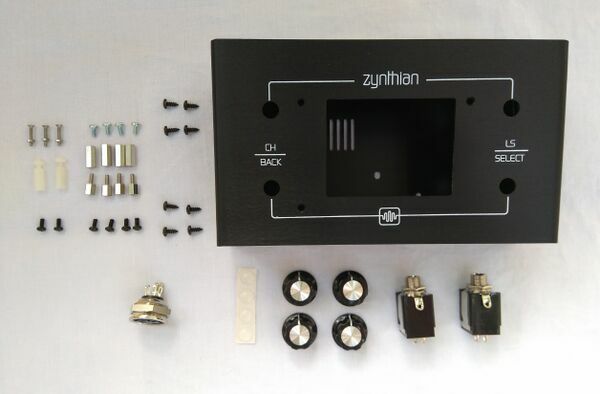 Again, this tutorial refers to the official Zynthian Aluminum Case, that is designed to be used in conjunction with the official Kit. If you have not soldered before, you should read a good soldering tutorial, or perhaps you would prefer the Soldering is Easy comic book by MightOhm. 1. Be careful to protect the components from electrostatic discharge. This is most critical for the ICs and the diodes. Be careful with your fingers. Your body can hold a good amount of static electric charge. Under some circumstances that charge can be drained through some of the components that you are handling and this could break the component. Try to hold the PCBs by the borders and discharge your body frequently touching some "ground" with your fingers. 3. When soldering, always avoid overheating. Electronic components doesn't like overheat! 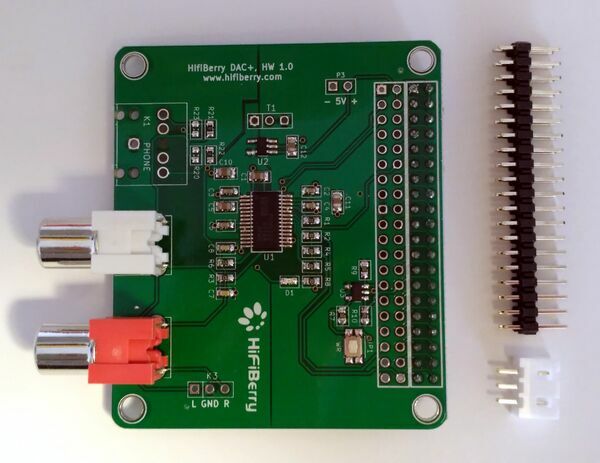 This is specially important when soldering the big connectors in the HifiBerry soundcard and the PiTFT touchscreen. 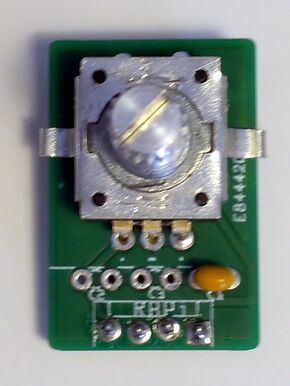 If you overheat the circuit, probably you will break some electronic component and you will end with a dead board. I recommend to use a fan while soldering. If not, you can use your mouth ;-) Also, don't solder the contacts in order. It's better to jump from one to another in the oposite corner. 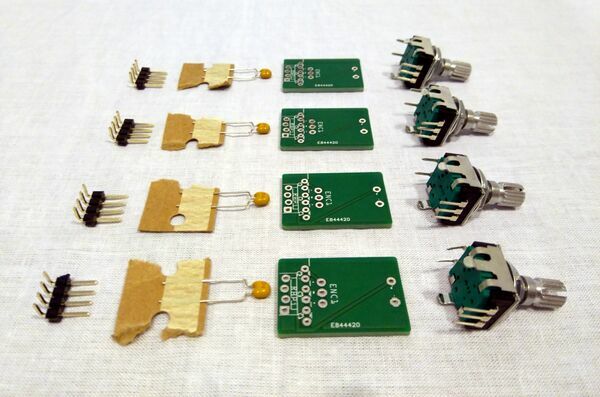 If you are not sure of your soldering skills, please, take your time and do some practice with inexpensive components and prototyping board. 4. After finishig the soldering, brush smoothly all the contacts. You may use a small iron brush. After that, blow over the circuit to remove any remaining tin. 5. Inspect visually all the soldered contacts. You could use a magnifying glass for verifying that every soldered pin looks good. If you are not sure, perhaps you could add more tin or re-solder the pin. Also, you could use a multimeter for testing the dubious contacts. 6. And of course, double-check everything! Assembling and wiring process are prone to errors. Don't be too confident ;-) Re-check component's orientation (ICs and diode), wiring, etc. 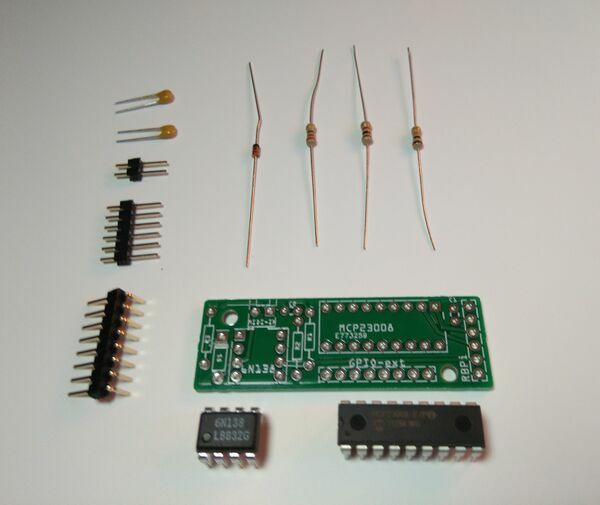 This components are used to build the 4 controller modules that form the input side of the physical Zynthian User Interface. 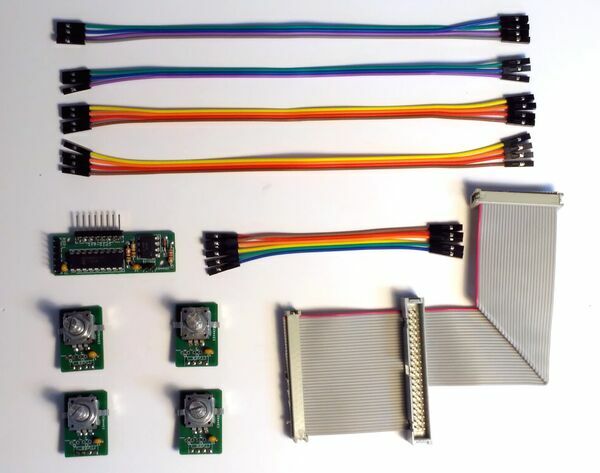 Each controller embed an incremental rotary encoder and a switch, so 4 wires are needed for connecting it with the RBPi GPIO. 0. Be sure that you have read and understdood these recommendations. 1. Bend the encoder's securing tabs to 75º, so you can insert it in the upside of the PCB (the labeled side!). Please, be very careful when bending the tabs as the encoder case is quite fragil and could be deformed. I recommend to use a small plier and not reaching to 90º. 2. Place the 100nF capacitor in C1 position (the most right!). This is for debouncing the push switch. 3. Place the 2 x 10nF capacitors in C2 & C3 positions. These are for debouncing the rotary encoder contacts. 3. Solder the encoder and capacitors carefully. 5. Solder the pin-row carefully. 6. Bend the pin-row outwards a little bit, like shown in the photo. You can use a screw-driver or similar to do it. 7. Use the plier to close the tabs again, trying to "catch" the PCB. 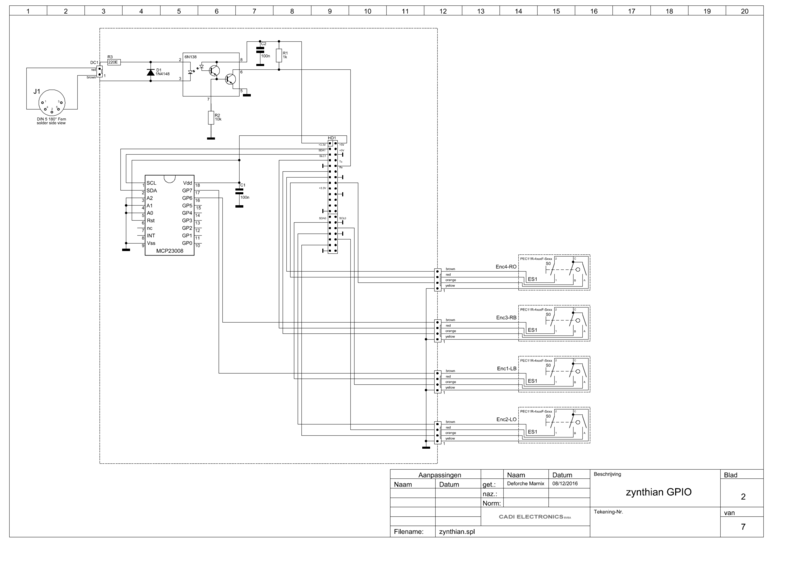 You have to build 4 controller modules, so you to have to repeat the steps 4 times. (*) Read from left to right with the tolerance ring (gold or silver) on the right. 0. Be sure that you have read and understood these recommendations. 1. Place all the components in the upside of the PCB (the labeled side!). Put attention to the orientation of the ICs and diode. 2. Solder the components carefully. Always avoid overheating! 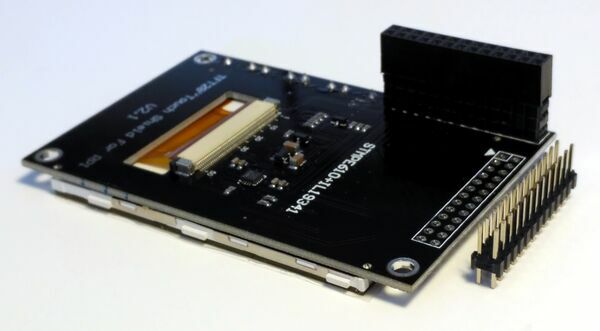 Both connectors must be placed on the top side of the board, so you should solder the contacts on the bottom side. WARNING! Soldering the big 40-pin connector can be difficult if you don't have enough practice. Please, before starting be sure that you have read and understood these recommendations. 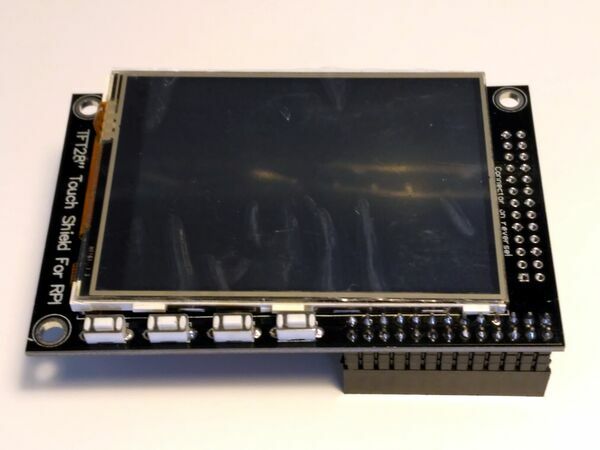 If you are using the Adafruit PiTFT 2.8' TouchScreen (or a clonic version) in a standard mounting (standard main ribbon bus and case size), is highly recommended to use the side 26-pin male connector, not the bottom female connector. 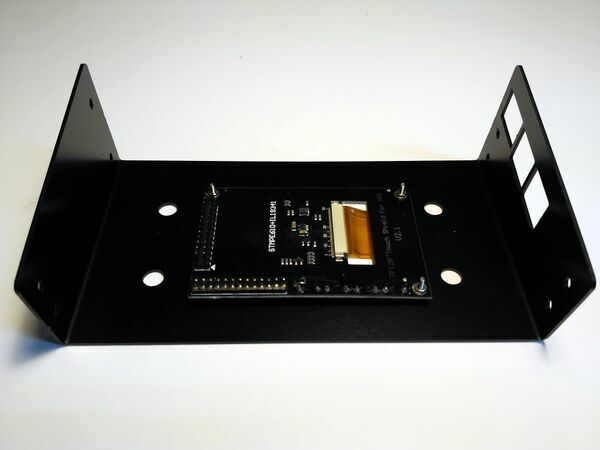 The main ribbon bus is designed to use the side 26-pin male connector, and the case mounting will be easier if you do so. 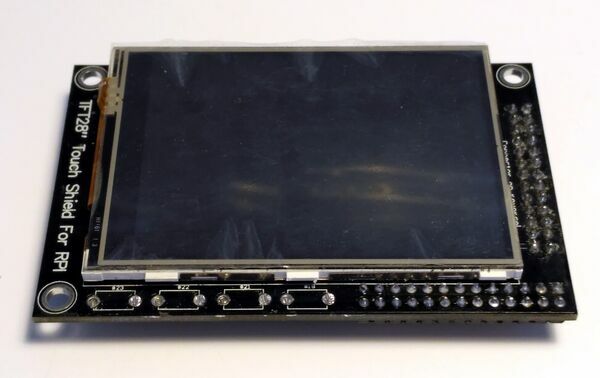 If you have an original Adafruit PiTFT 2.8' TouchScreen, probably you have both connectors soldered in the board, so you don't need to solder anything. Anyway, the bottom female connector is quite annoying when trying to close the case, so perhaps you want to remove it using a saw. If you do so, i also recommend to use a vice. If you have a clonic PiTFT 2.8' touchscreen, probably you don't have the side 26-pin male connector soldered on the board, so you should solder it by your own. 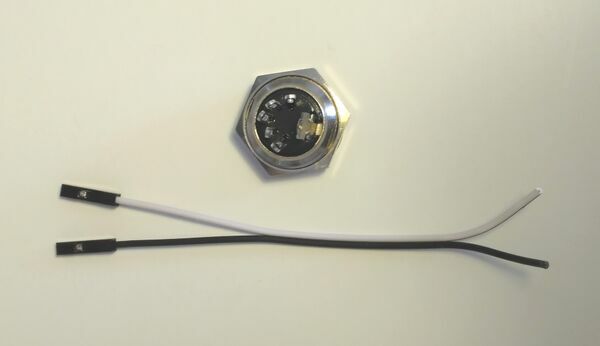 Also, normally the female connector in the clonic versions is higher that in the original and more annoying yet, so, you will want to remove it with a saw. If you do so, i also recommend to use a vice. 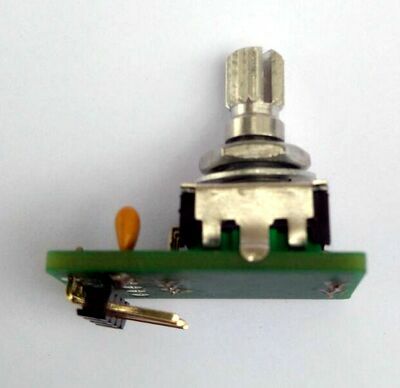 After removing the female connector, the side connector must be soldered. Note that you have to place it on the bottom side of the board, so you should solder the contacts on the top side. WARNING! 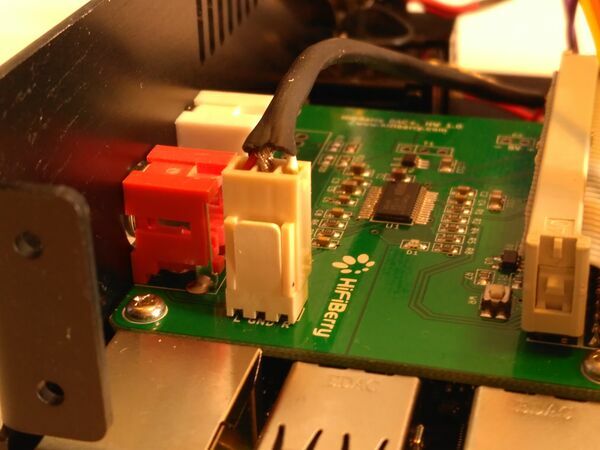 Soldering the 26-pin connector can be difficult if you don't have enough practice. Please, before starting be sure that you have read and understood these recommendations. Frequently, clonic PiTFT touchscreens have 4 switches welded on it. These switches can be annoying when holding the display to the case. 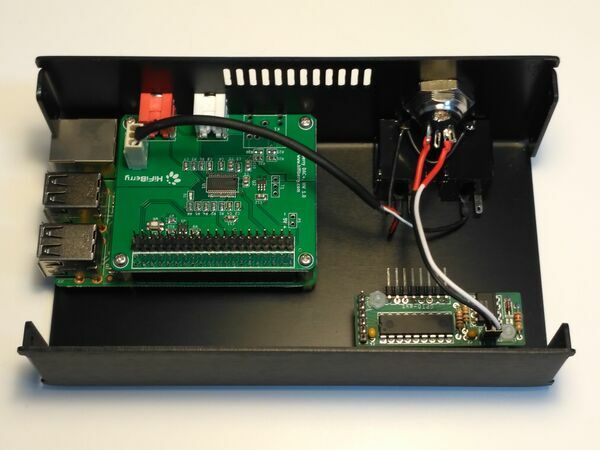 If the switches remain pressed after mounting, then it will cause problems as are connected to the GPIO and will conflict with the controller modules. The switches are easily pulled out by slighty turning each switch parallely to the board with a plier. 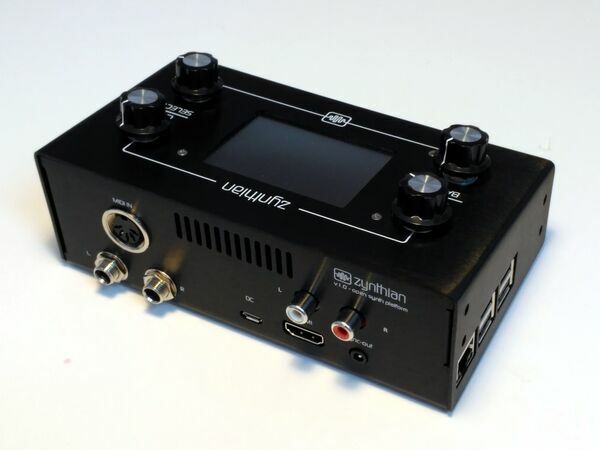 If you are using a different soundcard or display, you'll have to see the best way to integrate it. If you do so, please, don't forget to give good feedbak in the forum or here, in the wiki. In the forum you can see what other users have done, and of course, don't doubt to ask whatever you want! Before mounting the MIDI-IN connector into the case we will solder the needed wires. Doing it in that way is rather more comfortable than trying to solder inside the case with all the wiring mess. 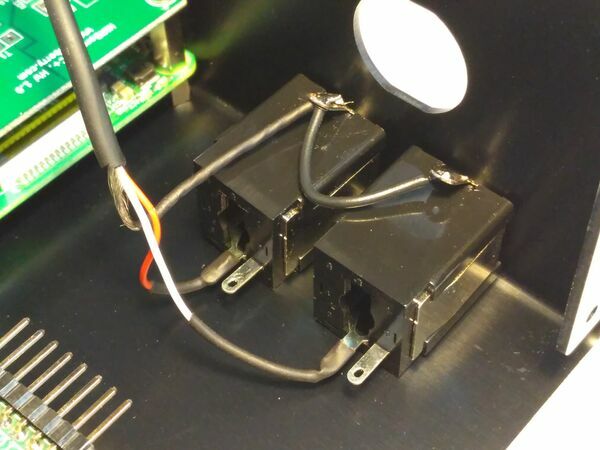 In the same way, before mounting the Jack connectors into the case we will solder the needed wires. You can use heat-shrink sleeve too. 1. fix the 2x4 separators to the RBPi. The bigger one must be on top and the smaller one on bottom. 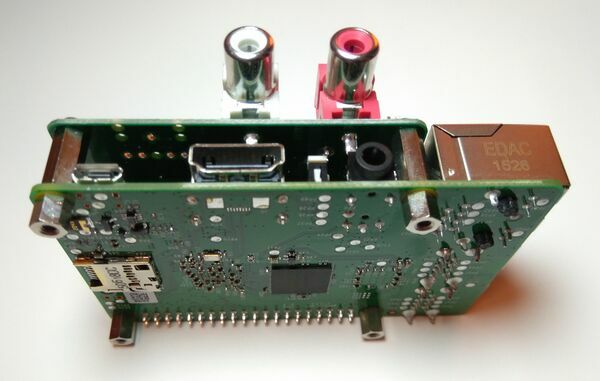 2. insert the Hifiberry soundcard in the RBPi. 3. screw the 4 bolts on top of the HifiBerry. 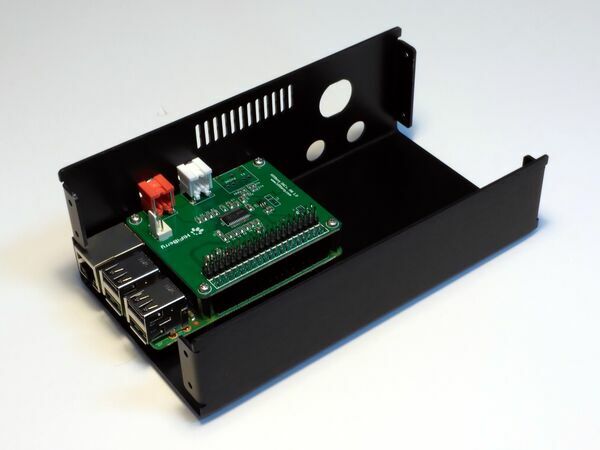 After assembling the main computing block, you should secure it to the case. 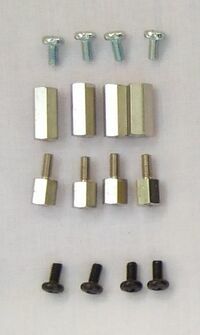 Use 4 black M2.5 bolts (see photo above). 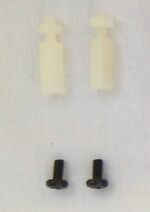 Secure the 2in1 module to the case using the 2 nylon separators with nuts and the last 2 black M2.5 bolts. Put the rings on the outer side of the case to avoid damaging the case surface when you tighten the nuts. The ground connector goes upwards. I recommend to remove it with a plier as it could "touch" the controller row-pins when closing the case. This step is a little bit tricky because the bolts & nuts are tiny, and it have some slack. Don't press too much the nuts. The PCB have to bend a little bit, but not too much. You should be capable of moving the display pushing the borders with your fingers. Later, when the screen is on, you will fine adjust the position for having the margins equalized. Note: Before fixing the screen, don't forget to remove the protective plastic sheet! 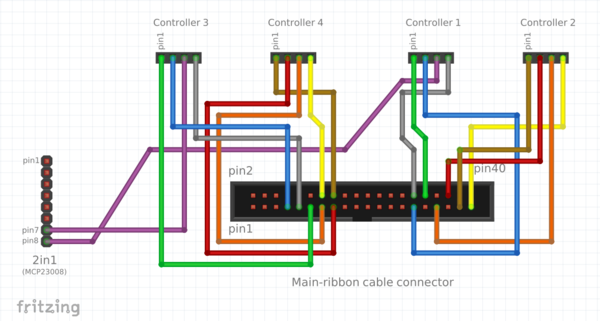 This is an easy connection guide, based in colored wires and images. If you want to know and understand the details (or if you have problems and need to debug), you should take a look to the Technical Reference. You can leave disconnected the two purple wires. 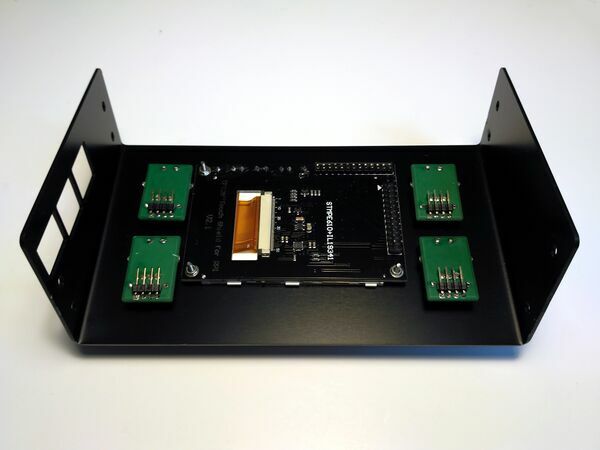 It's more comfortable to connect it to the 2in1 module after pluging the Main Ribbon Bus to the RBPi. Note: While connectig the wires, the red wire of the Main Ribbon Bus must be at left. The red wire is ALWAYS the #1! 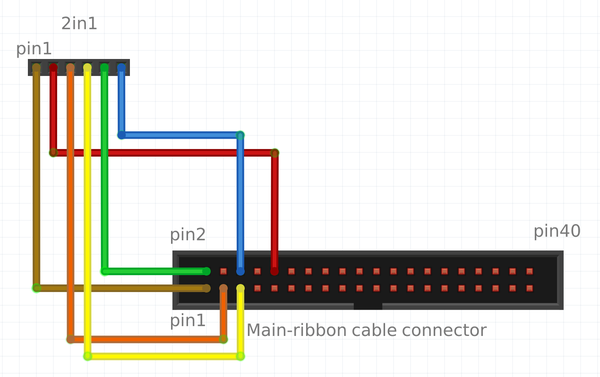 It's time to connect the Main Ribbon Bus to the RBPi GPIO. 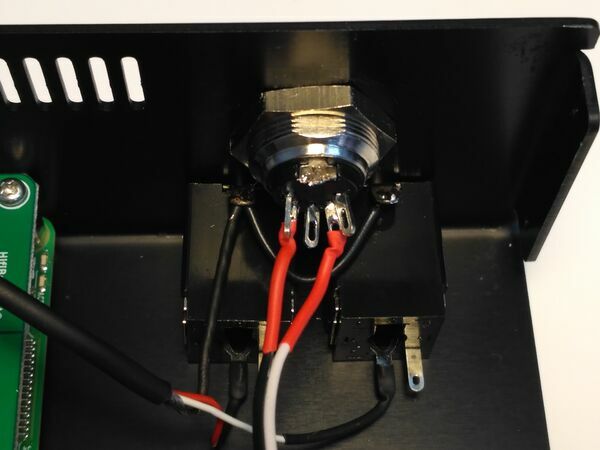 When looking to the case from the front side, the red wire must be in the right, like in the photo above. It's also time to connect the two purple wires to the 2in1 module if you haven't done before. 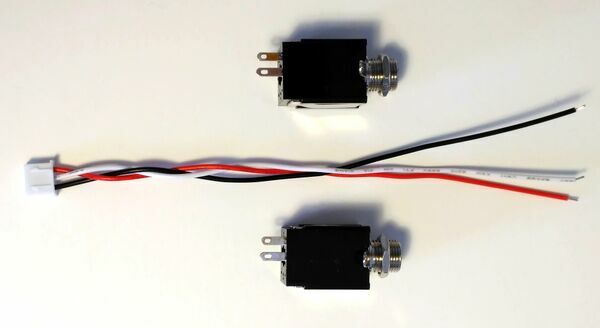 This two wires are for the upper switches: CH(1) and LS(3). Anyway, if you take a look to the next photo, you shouldn't have any problem. Brown/green wires are #1. 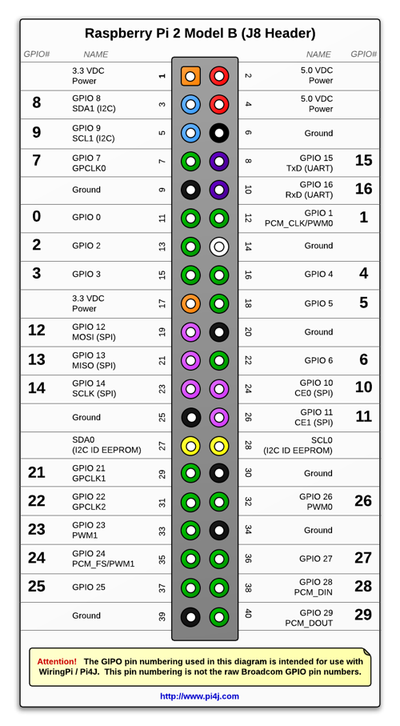 Note: Some encoders have a different pin ordering. If you bought the encoders by yourself, perhaps you have to change A and B pins (brown<=>red, green<=>blue). 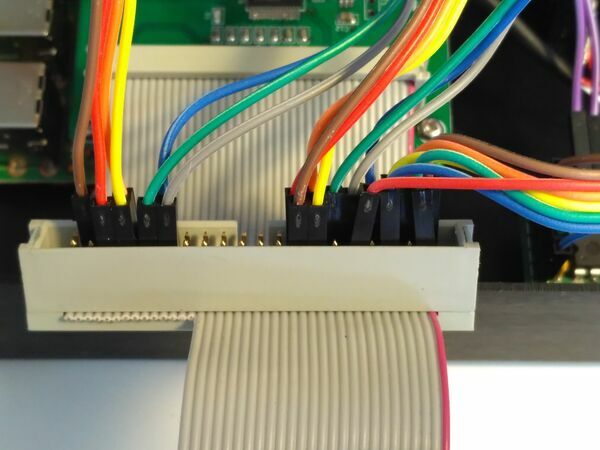 Also, if you haven't done this before, connect the DIN-5 connector (MIDI-IN) to the 2in1 module. It's the 2-pin connector labeled as MIDI-IN. 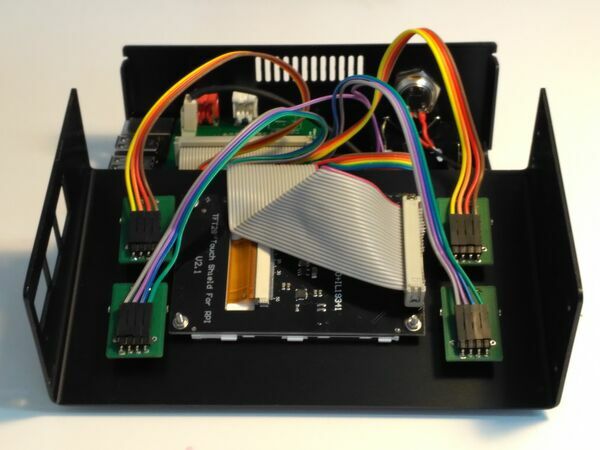 And finally, connect the ribbon's 26-pin connector to the ScreenTouch. And that's all. Your Zynthian Box is almost ready to boot. I recommend that you double-check everything before trying to boot. 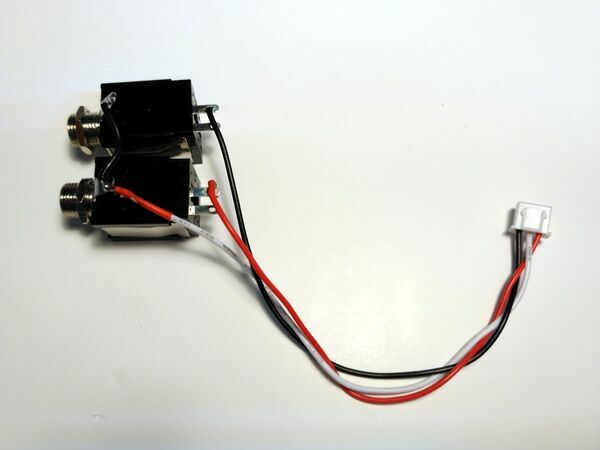 It's easy to make a mistake while assembling the parts or connecting the wires. 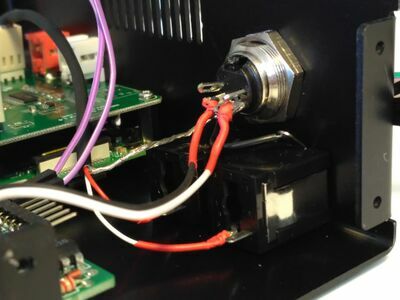 Some errors can be dangerous for the electronic components (short-circuits, some specific bad-wiring combinations) so it's better to be sure that everything is correctly assembled and connected. 1. Insert the SD-card with the zynthian image ready to run. If you don't have one yet, read this. 2. Plug the mini-usb power conector. A good 5V micro-usb charger is recommended (> 1 Amp). If you get the Zynthian UI, congratulations!!! You are really close to get it!! If not, bad luck! Probably you made some mistake during the mounting process. You have to locate and solve the problem(s). If you get the Zynthian UI, then you should start by testing that your controllers are working OK.
1. Push the 'SELECT' controller. You should get into the 'Engine Selection' screen. If it doesn't works, try pushing the 'LS' controller. Perhaps you have cross-wired the 3 & 4 controllers and in that case, you have to fix the wiring. If it doesn't work, try pushing the other two controllers and rotating the controllers. 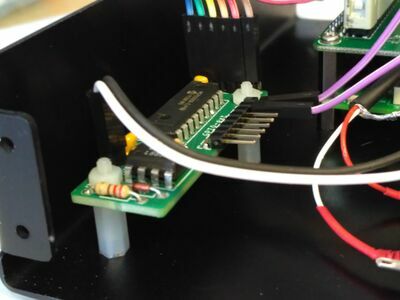 If something happens, most probably you have reversed the wiring order when connecting the controllers, or perhaps you have changed some wires while connecting the main ribbon bus. Double-check the wiring again. 2. Rotate the 'SELECT' controller to select the engine you want to start. The selector must go down when rotating clockwise and go up when rotating counterclockwise. If the rotation sense is reversed, you should check the wiring. 3. Push 'BACK'. You should get into the 'Admin' screen. Push 'BACK' again to return to the 'Engine Selection' screen. 5. Rotate every control to test that it works and that the rotation sense is correct. If some controller doesn't work correctly, check the wiring again. You could try to figure what is happening by analizing the observed behaviour. 6. Push 'LS' to get into the 'Load Snapshot' screen. Push 'LS' again to 'Save Snapshot'. Push 'BACK' to return to the 'Instrument Control' screen. 7. Push 'CH' to jump to the 'Channel List' screen. 1. 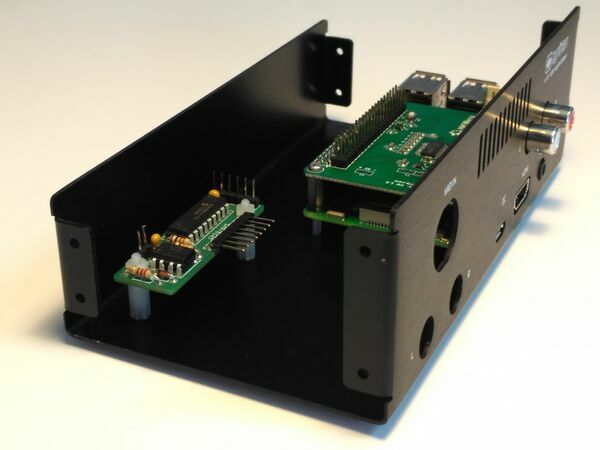 Connect the audio output (RCA or Jack connectors) to your amplifier or auto-amplified speakers. 2. Boot your Zynthian. You should be in the initial 'Load Snapshot' screen. 3. Push BACK twice to get into the 'Admin' screen. 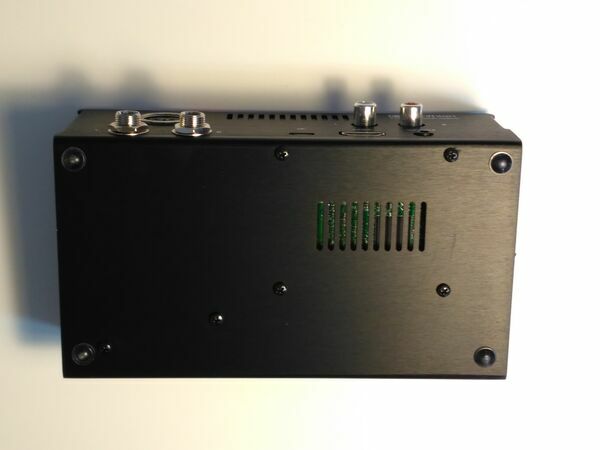 If you hear nothing, please, check the amplifier, speakers, cabling, gain, volume, etc. If nothing works, you have to locate and solve the problem(s). 1. 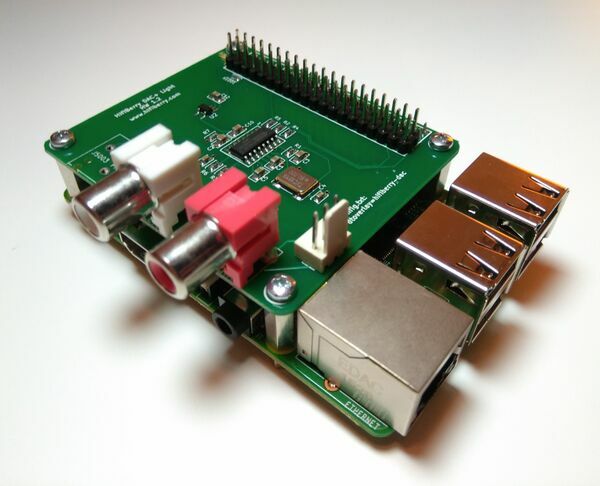 Connect the audio output (RCA or Jack connector) to your amplifier or auto-amplified speakers. 2. Boot your Zynthian, select FluidSynth engine, channel #1 and 'FluidR3 GM' bank. 3. Push BACK, holding the switch pushed more than 2 seconds. You should get into the 'Admin' screen. 3. 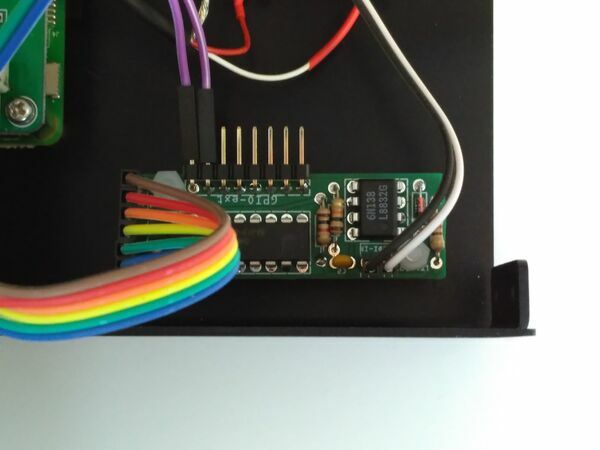 Connect a MIDI-USB keyboard to any USB port. The keyboard should be configured to use channel #1. If this doesn't work, you have to locate and solve the problem(s). 3. 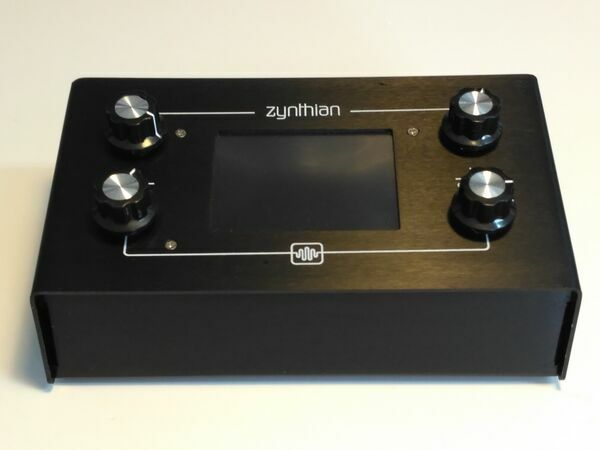 Connect your keyboard's MIDI-OUT to the Zynthian's MIDI-IN using a MIDI cable. The keyboard should be configured to use channel #1. When everything is working OK, it's time to close the case. This can be a little bit tricky. Take your time to see how to bend and drive the cables to get a good fitting. Finally, screw-drive the 8 sheet-threader bolts for securing the case, 4 each side. The update process can take some time. Be patient. If you get some ERROR message while updating, please, [in the forum]. You can send a photo or description of the error message. In this section i will try to give you some tips for locating and solving the problems you may have. 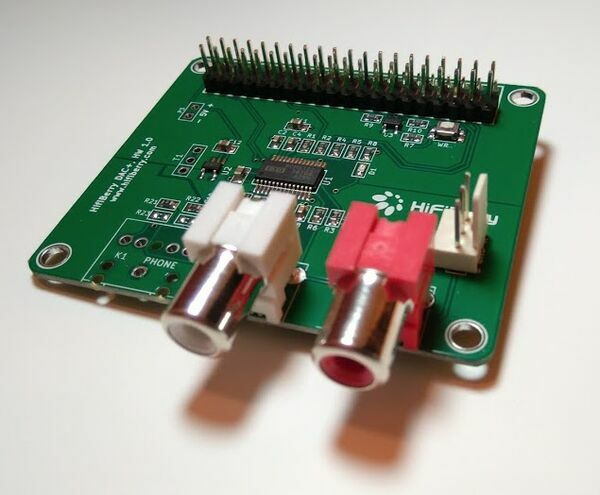 For finding and solving problems, i really recommend to connect a HDMI display to the RBPi. It will give you accurate information during the booting sequence. Also, if you connect a USB keyboard, you can login into the system and get extra information, inspect the logs, etc. I recommend you disconnect the controller and 2in1 modules and try to boot again. If the problem persist it's very probable you haven't solder correctly the side 26-pin connector. You should double check the connector and be sure that it's correctly soldered. In that case, probably the system is not booting correctly. You could try to connect a HDMI display and see if the system is booting. If you can't see the booting sequence, then you should re-burn your SD-card with the Zynthian image. Also, check that your image file is correct by using the SHA1 signature. Finally, i have included here some detailed schemes and tables. People hacking the standard Zynthian design would find it very useful. Also, if you have some problem and need to "debug", you would find it useful too. 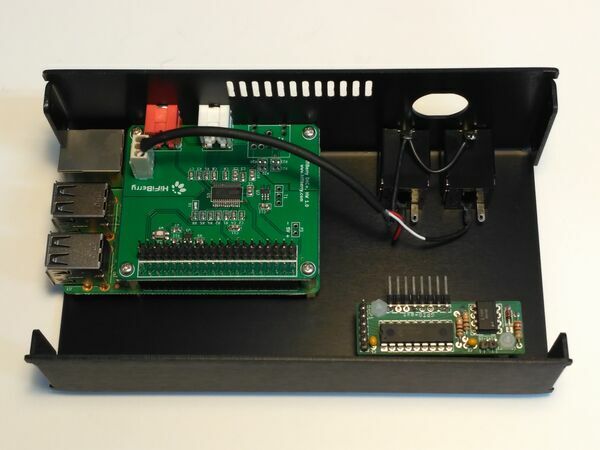 You can find all this info and much more in the project's Hardware Repository. Note: The colors indicated in this scheme doesn't match exactly the colors in the schemes above. EDIT from music.friend: I think that actually the 2nd from left pin of the MIDI IN socket carries the pin number 5. 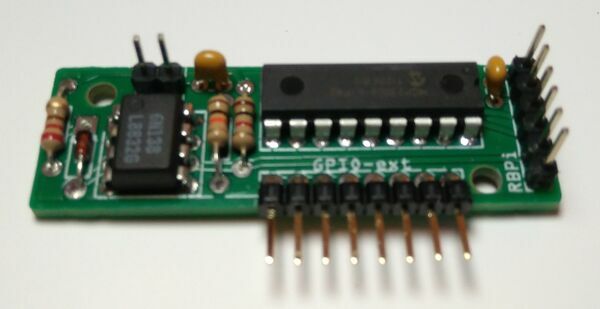 Pint 2 of the MIDI IN socket is used for MIDI OUT and MIDI THHRU for shielding (Connection to GND), while the MIDI IN socket has no direct connection to the receiver, otherwise the Optocoupler does not really make sense. NOTE: This is my first WIKI edit - please forgive me if i have misssed to follow existing style or other rules.